Close encounters of the reptilian kind: Jayne Gorman gets up close and personal with the Northern Territory’s more – intimidating – attractions and discovers there’s more to Darwin that it first seems. The scenery in the top end of Australia was like nothing else I had seen in the country, or indeed the world. At the northern tip of the Northern Territory is its capital Darwin – a quirky gateway to the state’s crocs and rocks. Most visitors to Australia's Northern Territory are likely to pass through Darwin en route to the outback; we took some time out in the city to recover from jetlag and discovered that Darwin has some worthy attractions of its own. What a funny sense of humour these Australians have, I thought. I wonder if any tourists actually buy these fake newspaper posters. Later that day we visited Crocosaurus Cove and I realised my error: there was nothing fake about those headlines. 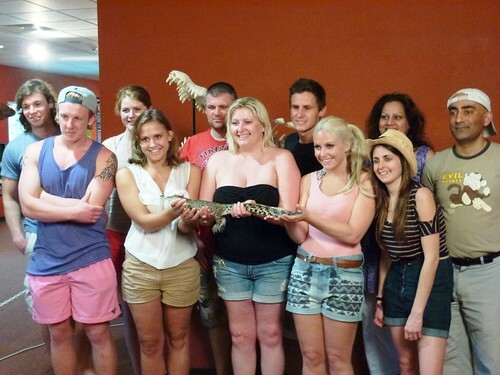 At Crocosaurus Cove you can get ‘safely’ up close and personal with the local predators. Opening with an unsettling demonstration of the strength of a croc’s jaw (involving a large cube of ice being obliterated in one), we watched the real things devour their lunch. 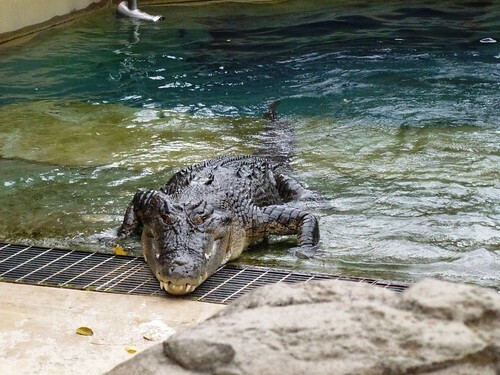 Crocsaurus Cove is home to several large prehistoric-looking crocs and if you consider yourself brave (read: insane), you can enter their cage and actually swim with them. Known as the 'Cage of Death', this experience provides fantastic photo opportunities for the adventurous minded (Read how Big Outback Adventure competition winner Tasha was brave enough to give it a go). For the tamer among us, there is another activity at the park involving feeding crocs – where you are not the main course! 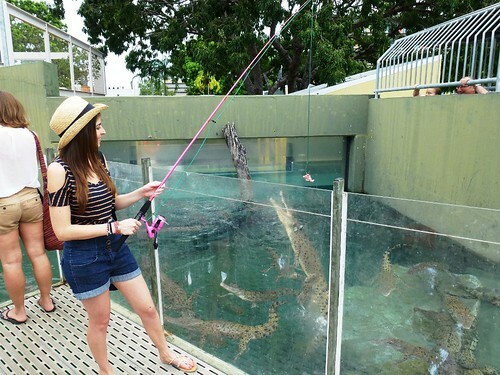 I fed baby crocs by dangling fresh meat on the end of a fishing rod, enticing the crocs to jump for it. Endless fun and certainly not something you do everyday! You can also hold one of these little creatures and feel their unusual skin, while Cove staff take a professional shot - so you have evidence of your courage!. 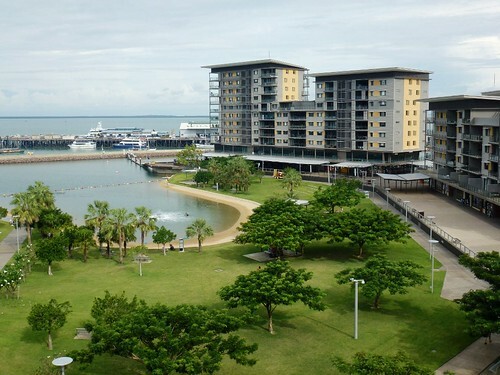 On the waterfront you will discover another side of Darwin altogether: a beach area and wave pool are bordered by modern restaurants and cafes. Separated from the water with sections of vibrant green grass, the waterfront cafes serve great iced coffee, with a transfixing view. The wave lagoon is the perfect antidote for energetic children – the waves rotate between those for boarding and those for bouncing around on rubber rings which are provided. Just half a day here will wear the little ones (and the big ones) out in no time. For the adults there are sun loungers to stretch out on and soak up the 30 degree sun (even in winter, that is). With such a warm, dry climate it would be a shame to stay inside at any point – especially at evening. Darwin's restaurants and bars make the most of the weather with outdoor seating and even dancefloors (see the Deckbar). 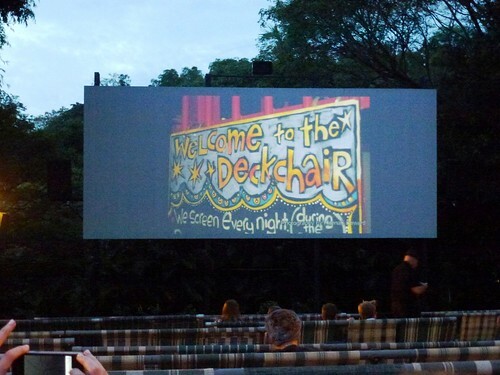 Movie buffs will be delighted by the Deckchair Cinema. Classic movies are projected onto a giant screen and are played out under the stars to an audience reclining in stripy deck chairs. You must also try the food here. Local restaurateurs set up a pop up restaurant in the grounds and distribute a tantalising range of Asian curries. These are perfectly accompanied by a cold beer from the bar. Darwin is a compact city and when the Darwin Central Hotel chose its name it wasn't lying. One of the city’s larger hotels, here you can swing the proverbial cat in the superbly located and spacious rooms. For business travellers (and internet addicts) you will be impressed by the super speedy WiFi at the Novotel. All guests receive 30 minutes’ free WiFi per day, and its recently refurbished rooms are sparklingly chic. You may be interested to know that you can also find free WiFi at the Darwin Central Mall as well as at most McDonalds outlets – all the better for letting your friends and family know what a great time you are having Down Under. Find out how you can experience Darwin’s chic bars and meet its reptilian inhabitants for yourself, with your very own Northern Territory Big Outback Adventure. Want more? Check out our Facebook album featuring Crocosaurus Cove’s ‘jawsome’ residents.